The new Maserati Gran Cabrio 2012 was launched at the Geneva Motor Show in March 2012 and it has truly taken Maserati’s range of convertibles to the next level of performance. 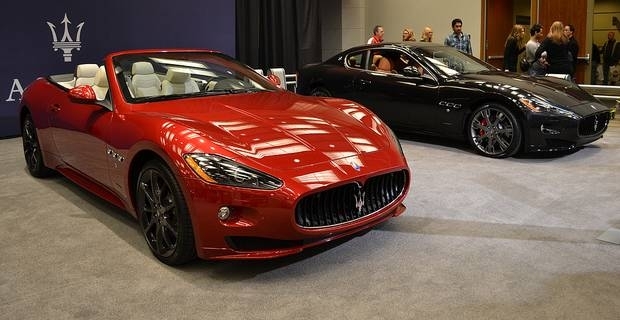 Some of the characteristics that make the Maserati Gran Cabrio 2012 stand out from the crowd are the distinctively aggressive look, a faster gearshift and more power than any of the manufacturer’s previous models. The Maserati Gran Cabrio 2012 features an upgraded MC Auto Shift transmission, which offers an enhanced fuel economy, and an improved 4.7 litre V8 engine (450 hp). The enhanced performance of the new convertible from Maserati is visible in the 0-100km/h sprint of only 5.2 seconds and the top speed of 285 km/h. Maserati’s cars are well known for their exclusivist looks and the new Gran Cabrio is no exception to that rule. The first thing to notice about the exterior design is the new colour introduced by the manufacturer especially for this model. The “Rosso Trionfale” colour is inspired from the Maserati racing cars of the 1950s. The bard in the grille and the headlights feature black finishes, to enhance the idea of a sports car. The dynamic, integrated design immediately differentiates this model from the rest of the cars in the range. You can choose from two new interior colours when buying a new Maseratti Gran Cabrio 2012: Grigio Chrono or Bianco Pregiato. Both these new colours perfectly complement the Rosso Trionfale body colour. The price of the new Maseratti Gran Cabrio starts from £ 102,615.